We turned right out of the apartment building and walked a couple of blocks over to the main thoroughfare that runs through Vedado. A few birds flew overhead, one car drove by. 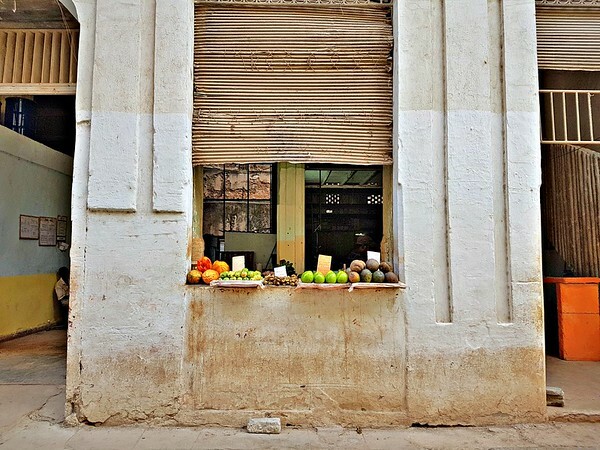 It was almost noon but everything was eerily still on this second day of exploring Havana. So eerily still, until we turned onto famous Avenida 23. Within one block, it suddenly seemed as if we had been transported into a completely different city than what we had witnessed the day before. Here were restaurants, a couple of bars, a scattering of shops, a cinema, a small group of prostitutes, a huge art-deco hotel, food stalls, a market and hundreds of people moving around everywhere. There was a higher level of that Caribbean oomph in the way people walked and talked and went about their…whatever it was they were going about. It could have been almost anywhere, it could have even been Miami Beach, maybe a couple of decades ago. We walked along, feeling good, chatting, laughing, enjoying this influx of sights and sounds and activity that we had assumed didn’t exist. 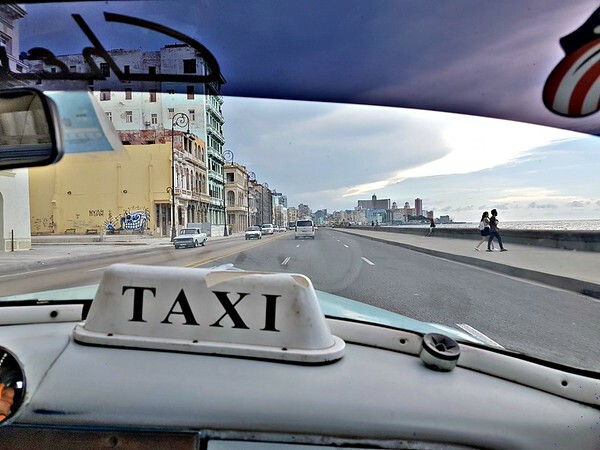 At the far end of Avenida 23, where the road gently slopes down before reaching the water, we hailed an old-school Lada taxi and drove off to Plaza Viejo in Old Havana. We then wandered up Calle Obispo and along Calle O’Reilly. 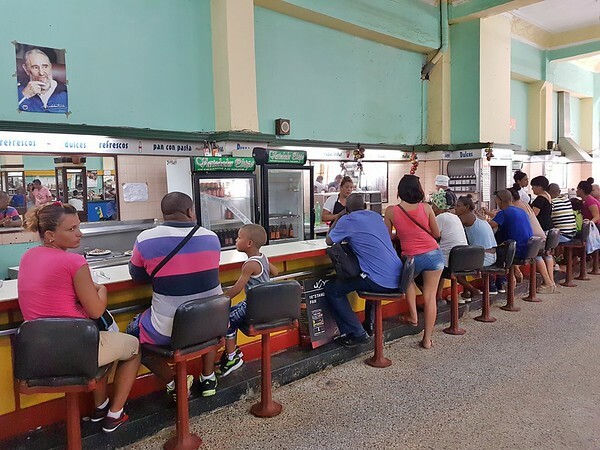 We ate lunch at Variedades Obispo – a local fried chicken and rice joint where you sit at a long, old, dirty, yellow bar and eat your food, with either a local beer or an orange soda. The stool I sat upon was ready to snap off it’s hinge, the silverware I used had only been given a quick tap water rinse, one of the employees tried to charge us 3 times the normal amount for our food. My friend and I went to the Santa Rosa Cafeteria & Bakery where we ordered some poor-tasting, bland pastries and watery coffee. We stumbled into art galleries so full of fascinating pieces that could only come from those who are forced to express themselves in unique ways. We ate pork sandwiches from a guy serving them up from behind a small table on the edge of the street. We stared at the colorful Chevrolets all lined up ready to take tourists for a spin. We people-watched and ignored the ‘today is a cigar festival’ scam attempts. 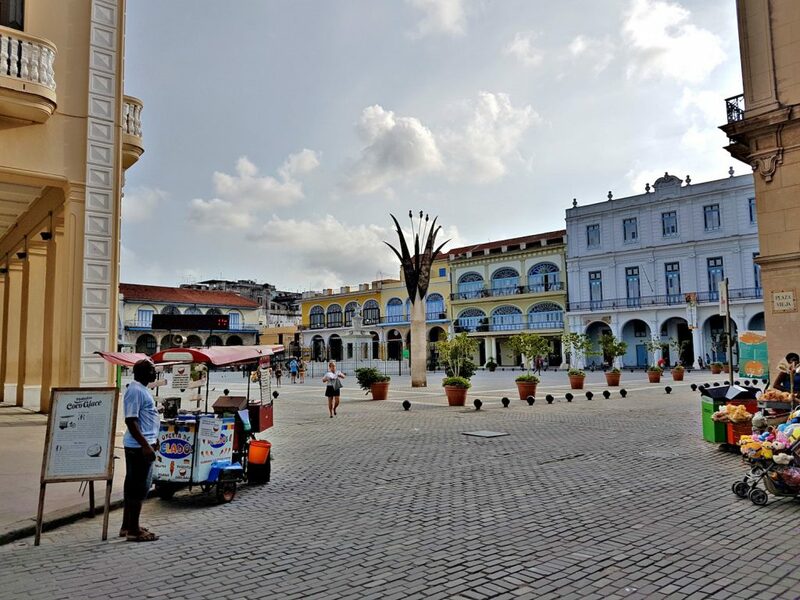 The blazing hot day rolled along – a fortress visit here, a coconut shell full of ice cream there, looking through old coins and passports and trinkets at the market, walking down side streets and into random plazas – until it was time to rest. At 5:00pm we took another surreal Lada taxi ride back to our guesthouse with an elderly and extremely kind driver that pointed out every possible ‘sight’ along the way. The Cardiac Hospital, the Maternity Hospital, cultural centers, parks, walls, night markets, famous hotels and more. After a quick nap and shower back at the guesthouse, we went for another stroll along that same Avenida 23, this time exploring Havana at night. At one point, as my friends and I were waiting to cross an intersection, a woman yelled out “Hello” from behind me. I turned around, only to be greeted by the raised hand and smiling face of a provocatively-positioned prostitute dressed in a tight blue miniskirt. I nodded politely, said “Hola” and then crossed the street. We passed a hot dog stand with a long line of customers and eventually we found a small, dimly lit pizza shop that sold bottled water. It caught me off guard for some reason. A minute later, with those words stuck in my head, and with 10 bottles of water in a plastic bag, I started walking back to the guesthouse with a little extra energy in my step. This was my trip to Cuba. I was running the show with confidence. I was present, observing and learning. I was opening myself up to people and places like I hadn’t done in a very long time. Finally, with control – not luck – I was getting my life in order again. 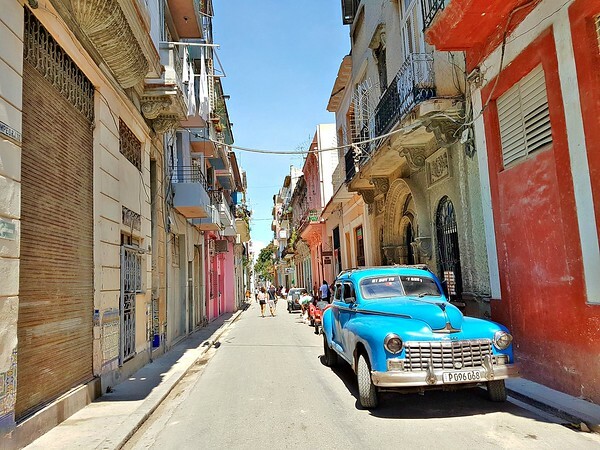 Is Cuba a destination you want to visit? 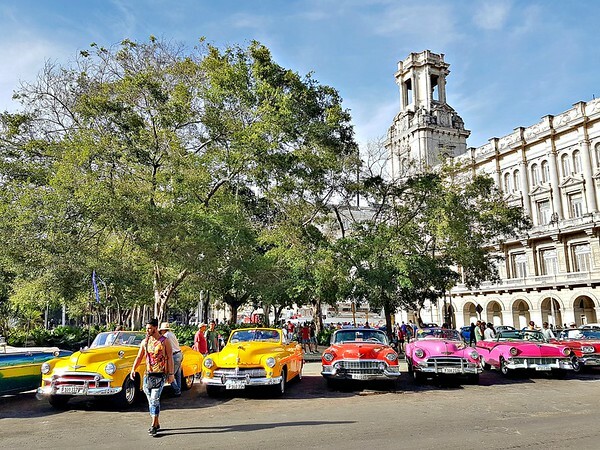 Is Havana your kind of city? Do you believe in luck? Now—I have Cuba on my mind. To clearly understand, as a US citizen , I do not require the 85$ visa? I would be leaving from Orlando. I enjoy reading from you. Hey Linda – You do require the tourist card. The official cost is around $25 but the airlines charge a fee to get it for you. That’s why it’s $85. But yes, you do need that tourist card to get in. Thanks Derek, I’ll look into this. Happy Travels! I hope language barrier would not be too much problem in Cuba, as in do the people speak passable English? You would want to speak some Spanish, definitely helps. English was spoken a little but for the most part, knowing basic Spanish would make a big difference. A provocative prostitute…a polite hello.. The woman’s mysterious laugh.. a momentary reflection on ‘luck’.. Wonderful story as they all are! I have a question about how you got your visa for Cuba. My understanding is that you have to be part of some kind of group doing educational work etc. Any tips on getting approved to go? Hey Lori – Actually, that has changed. There is a list of 12 categories that US citizens need to fall into (as per the US government, the Cuban government welcomes US citizens no problem) but you no longer need to apply for a permit. So if you fall into one of those categories, you’re allowed to go and don’t need any further approval. You just need to say to yourself that you fall into one of those categories. Like the way you tell your story. 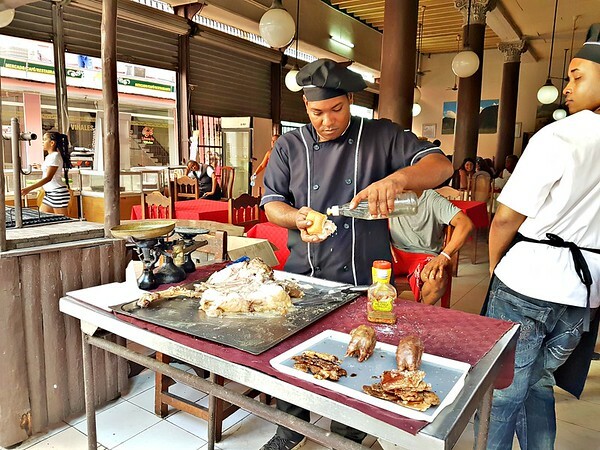 Most blog posts about Cuba is focused on the destination itself, very little on the experience and realizations. Though you only touched a little about opening one self up to people and getting control of life once again.. there are people who felt this and was able to relate.